Air conditioning is used in summer when the inside of buildings become uncomfortably hot. It is likely that when cooling is required inside, the outside temperature will be even hotter. For this reason energy has to be expended to force the heat out of the building: air conditioning works against nature and is based on the principle of "wasting" heat. 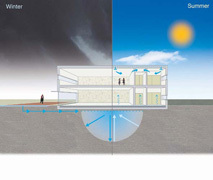 Luckily there is now an alternative means of providing cooling to buildings which is much more natural – less expensive because it requires less energy and free from the need to emit carbon.